wow, this is a pretty one! These are five things that make my life in the kitchen BETTER. Plus a bonus! As always, leave a comment to tell me what some of yours are, cooks! Once, on the subway platform, my then-fiance hugged me. Well, it is nice to be appreciated for one’s details, isn’t it. Still, when I told him that I wanted a butter bell for our kitchen, he was skeptical. “It seems like makework,” he said, when confronted with the idea of stuffing cold butter into a dome that would fit, hanging, into a slightly larger glass canister with water in the bottom. 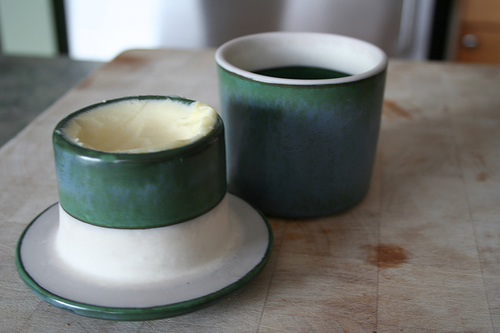 The purpose of a butter bell is to keep some of your supply at room temperature or easier spreading. With a slight vacuum seal, it doesn’t have to be refrigerated that way. It actually doesn’t have to be refrigerated even if you don’t have a butter bell, sayeth many Europeans and other people like my friend Heather’s family. But a butter bell keeps it safe from the flies. And the wives. Oh, until the catsitter, I mean the cat, broke ours. The catsitter is the person who cleaned it up and wrote the note. We need another one. Butter bell, not cat sitter. We’ll get it after we move so we don’t have the pack it and pay someone to move it 5 blocks. Maybe a gorgeousy pottery one like the one in the picture! If you cook a lot, you know what a pain to be constantly dragging the salt out of the cabinet. And a shaker doesn’t let you pinch or dash or measure. We have some tiny bowls that we got in Turkey that we can grab (or spoon) salt from, and that is great for the table. But we finally got a salt pig, which looks like a submarine scope, and lets a cook just reach in and grab some salt and toss it in. It’s a super thing. It’s apparently shaped that way to resist moisture. It does do that, in a way that the tiny Turkish bowls do not. Why it is called a pig, however, is a mystery. It needs to be seasoned. You’re not supposed to wash it with soap. You have to dry it after washing it so it doesn’t rust. You can (and will) burn the hell out of your hand on the handle. You don’t want to drop it on your foot, or get all livid and brain someone with its heft. See, it has a lot of quirks and you need to take special care of it. But like many of the best friends, it is worth every quirk. This $8 pan sits among many fancier ones that get passed over daily, and it gets chosen, always. I’ll own it forever, and it never lets me down. Puts a wonderful caramel coating onto meat or mushrooms or french toast. Also, these items can go under the broiler. Also, enamel comes in a range of fully excellent colors. If you ever get a yen to buy me something really pricey, enameled cookware is a good choice. Thanks in advance! I love you, too! Coriander, cumin, cardamom, née coffee. It’s a wonderful thing to be able to grind these things whenever necessary. But be warned: it’s okay to have coffee that tastes like cardamom. It’s less okay to have it tastes like coriander. But even that is preferable to coffee that tastes like cumin, which is what makes meat taste pungent and like man-sweat but in a good way. I don’t have one. But soon I am going to, and it is going to change my whole entire life. Just imagine: everything will be perfect! Thanks to D’Arcy Norman on Flickr for use of this Creative Commons-licensed photo! yesterday the Vivid Girl was pretending to be all manner of tiny dogs and then asking me to name her (and then rejecting the names I came up with and demanding that I call her Butterfly or something). The name I really wanted, but didn’t reveal because I didn’t want to subject it to rejection, was Salt Pig. so I think I need one of those too, except…. I have a lovely marble mortar-and-pestle that I bought on clearance-plus-employee-discount many years ago when I worked at Pier 1 Imports. I use it as a spice grinder and as a salt pig, kind of, in that I like to buy crystally salt in pretty colors (right now it’s pink) and grind some up and pinch it out. I also believe that grinding salt in between spices makes it clean, but who knows? Also, it’s green. i have a tiny, tiny little collander that my friend ellen bought for me. i use it for rinsing stuff–it perfectly holds one can of beans for rinsing; or a few handfulls of wild maine blueberries; or two-kids’-snacks-worth of strawberries;or that same portion of grapes. i truly use it daily. it fits in a drawer. i could always use the big pasta one, but i feel so excessive when i do: it’s just too big for most jobs, and i start to convince myself i only have to wash the bottom 1/8 of it because that’s only as far up as the rinsed-ingredient reached. and lastly–wait-i am noticing a theme here– an assortment of cutting boards. See above comments for size -to-job ratio, and for where they ALL end up by the end of the day. You convinced me to investigate all things butter bell. While looking up prices and varieties on Amazon, I also came across the skillet F has been lusting over for a year. It was on sale, so I bought both and we celebrated F’s birthday one month early. I told him to thank you for the lovely night! My favorite kitchen thing has to be the KitchenAid stand mixer, despite the counter space it steals. I love making bread, and this machine kneads it to perfection. Now I have soft *real* butter to enjoy with the bread. Hooray!